Current developments on the interface of psychology and law in civil justice: reconciling law, science and policy. Citation: Koch HCH, Hampton N, Midgley S, et al. Current developments on the interface of psychology and law in civil justice: reconciling law, science and policy. J Psychol Cognition. 2017;2(2):83-85. Research and debate about the interface between Psychology and Law has largely focused on the criminal justice system. This paper illustrates innovation in the civil justice context in the UK to address this crucial issue. Research and debate needs to redress this imbalance to bring collaboration between law and science to the forefront. Psychology, Civil justice, Evidence, Science. Law and science (health/medicine/psychology) are integrally linked in practice in the field of civil litigation, with its emphasis on understanding personal injury and medical/ clinical negligence and associated policy. Legal processes and clinical/medico-legal processes inform each other. Judges require robust evidence and advice in both areas and this reflects the importance attached to ‘pain and suffering’ as a consistent part of modern legal, political and social life. Both law and ‘science/medicine’ can be understood as practices in the management of uncertainty. The legal process is in one sense the identification of ‘true’ facts and fact-finding in the face of ambiguity. Similarly, ‘science and medicine’ is about the eliciting of facts in the face of many disparate possibilities, differential diagnoses and statistical/ research findings from these two high status forms of expert knowledge. Reconciling the two sets of findings and accommodating apparent competing views or stances is an ongoing challenge. Law and science/medicine are both highly technical forms of expert knowledge. They are both pragmatic forms of knowledge, concerned with ‘getting things done’. Clinicians want to help their patients get better; Lawyers want to come to a just and fair final legal decision . The interface between Psychology and Law has been well documented in the criminal justice system [2,3] but largely ignored in the civil justice system. Recent publications have started to present a unique insight into how psychology impinges on the medico-legal trail involved in the conduct of civil compensation claims . 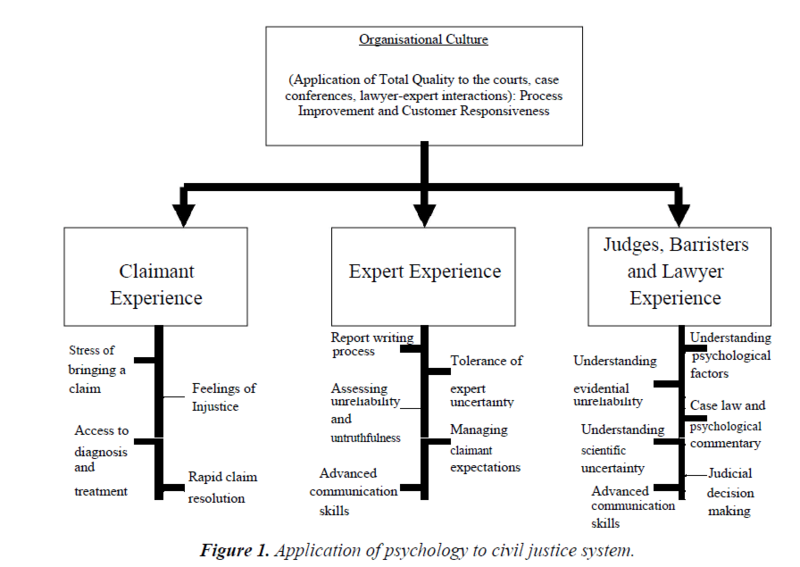 These processes affect all parts of the civil justice system at a macro and micro level, alike, as illustrated in Figure 1. Figure 1. Application of psychology to civil justice system. Recent editorials in the leading UK Law Magazine ‘Modern Law’ have reflected a growing interest in how psychological processes, both individual (‘micro’) and group/organisational (‘macro’) impinge on Law firms [14-17]. It is important that academic and practitioner groups are active in promoting the understanding of the interface between Law (and legal systems) and science, psychology and health especially in the context of civil cases and litigation and thereafter to provide education to legal students and practitioners on these issues. Its mandate should be to inform the scientific, medical and psychological communities on the one hand, and legal communities on the other, and also the public, of current research and practice in the area of science and law . Civil court rooms admit evidence from health care experts in order to assess injury and determine quantum. Generalizing from seminal work in the USA  and a critique of American Case Law, it points to a need for Law and Science to address the use and misuse of science, and both sectors’ narrow constructions of rationality and logicality which can often have the effect of divorcing science and ‘facts’ from their psychological and social context [18,19]. Academic and practitioner groups would be well advised to address the intersection and interface between law, science, in its broadest sense, and associated policy making. Both groups have significant expertise to increase the understanding of how these three areas interact in the modern world and to promote policies which clarify and solve legal-oriented challenges. Multidisciplinary research and education can make a major contribution to the generalisation and dissemination of medico-legal knowledge  and, as a result, improve the decision-making processes undertaken by judges, lawyers, jurors and scientific/medical experts. Both US and UK legal frameworks and practices have an inbuilt uncertainty which individuals and professionals have a variable tolerance of and ability to manage, especially after evaluating contentious scientific evidence in legal claims. This issue of uncertainty tolerance is nowhere better exemplified than in the two areas of credibility assessment and judicial decision making. Credibility assessment lying as it does between the judiciary and the expert witness is a crucial issue when any case is being constructed, argued and litigated. Researchers at Portsmouth University have grappled with the ‘holy grail’ of verbal and non-verbal indicators of potential unreliability and untruthfulness and continue to do so . Judicial decision making and the question ‘what makes a good judge’ continues to be debated with ‘significant numbers of words’ producing ‘limited clarity’. The application of psychology to this crucial area is paramount and research is needed to clarify the conscious, positive behaviours that ‘good, effective and fair’ judges incorporate into their practice of logical reasoning, certainty seeking, impartiality and overall management of their complex but highly valued style. At an organisational level, innovative research being developed at the Faculty of Law, Stockholm University is constructing a model of ‘Therapeutic Jurisprudence’ applicable to the civil courts. This model, developed in the USA in the 1980’s, is consistent with much of the Total Quality Management model of business/organisational success promulgated in manufacturing industry in the 1970’s/80’s . This encourages alternatives to adversarial litigation between ‘opposing’ legal teams and promotes, instead, a more multi-disciplinary and cooperative model of decision making . This paper is aimed at encouraging growing interest in the intersection of law and science in civil litigation. It is suggested that professional and interdisciplinary partnership, research and education (both undergraduate and postgraduate) should be aimed at collaboration and cooperative problem solving in the field of civil case compensation. Key areas of developing expertise include the assessment of credibility of claimants and the greater understanding of judicial decision making. Both these areas are crucial in the evaluation of contentious scientific evidence in legal claims, and contribute to legal and expert witness experience and behavior. Klein D, Mitchell G. The psychology of judicial decision making. APA, Oxford University Press. 2010. Oxburgh G, Myklehurst T, Grant T, et al. Communication in investigative and legal contexts. Wiley, Blackwell, Chichester, UK. 2016. Mermon A, Vriz A, Bull R. Psychology and law. McGraw-Hill, London. 1998. Koch HCH. Legal mind: Contemporary issues in psychological injury and law. Expert Witness Publications, Manchester. 2016. Koch HCH, Addy K. Material contribution and the ?But For? test: Legal mind case and commentary. PIBULJ. 2016. Steel S. Proof of causation in Tort Law. Cambridge. 2015. Koch HCH, Court K, Bates S. Medico-legal implications of assessing unreliability in civil compensation cases. Scholarena Case Reports. 2016;4:106. Koch HCH, Akehurst L, Easton S. Judging credibility in a road traffic accident claimant. J Case Report Studies. 2017. Koch HCH, Newns K, Boyd T, Peters J. Assessing malingering and deception in forensic, judicial & clinical contexts: Are various communications ?congruent?? Expert Witness Journal. 2016. Koch HCH, Elson P, Cosway R, et al. Specific phobia following road traffic collision: Medico-legal Issues of diagnosis, causation & prognosis in a simple case study. Mathews J Case Reports. 2017. Koch HCH, Beesley H, Formby C. Civil claimant embitterment: Five case studies exploring clinical presentation and management. Medical Case Reports. 2017. Koch HCH, Diesen C, Boyd T, et al. 21st century agenda for the justice system: Therapeutic jurisprudence and total quality management. Solicitors Journal. 2015. Koch HCH, Diesen C. Contemporary 21st century therapeutic jurisprudence in civil cases: Building bridges between law and psychology. 2015. Koch HCH. The best of the best ? how can universities reflect the 21st century legal sector? Modern Law. 2017. Koch HCH. Impartiality of medico-legal experts. The Expert Witness Institute Newsletter, Spring. 2017. Koch HCH. Keeping our moral compass. Modern Law. 2016. Wallace C. Reforming the legal services market. Modern Law. 2015. Koch HCH, Palmer H, Reay K. The interface between psychology and law: Continuous improvement in claimant, lawyer and expert?s experience. Expert Witness Journal. 2017.
Cooper SL. Forensic science identification evidence. Journal of Philosophy, Science and Law. 2016;1-35. Oakland J. Total quality management. Heineman Press, London. 1989.